Discussion in 'News & Rumours' started by Pink Cadillac, Feb 26, 2017. 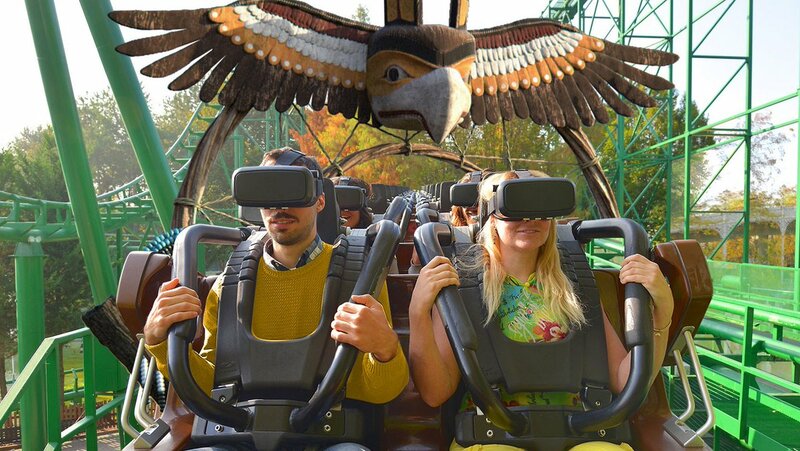 The Europa-Park presented it in the autumn of last year with "Alpenexpress VR-Ride" , in the meantime virtual reality roller coasters have spread around the world. In 2017, "Master Thai" in the Italian Mirabilandia is joined. The "Master Tai" family-run train, which was opened in 2011, is equipped with virtual reality technology. Passengers use a virtual reality spectacle during the roller coaster ride and immerse themselves in a virtual experience synchronized to the real ride. It is not yet known which "movie" will be shown to the passengers of the virtual reality roller coaster in Mirabilandia. The design of the announcement graphics, however, he will be based on the adventures of the Indiana Jones. As a result, Mirabilandia plans to expand its VR roller coaster. "Master Thai" is a so-called "dueling coaster": two trains start parallel and deliver a head-to-head race. Work is ongoing at Gardaland for the preparation of the new season in 2017 and visitors to the park today will begin to discover the theming of the legendary coaster that, from the start of next season, will ensure more immersive virtual experience. A large Dreamcatcher, striking object-symbol of the culture of the American Indian, is the portal through which to reach the world of spirits. Positioned along the path of attraction and visible to all, the imposing sculpture suggests that the adventure will be set at a time when Native Americans considered the Dreamcatcher a sacred object. There will throughout the totem area references, objects, symbols and icons typical of the fascinating part of the world. Set design and theming are designed to engage the guests in the adventure before you even get on the coaster; Also the surrounding green area will be transformed into a typical setting of the Rocky Mountains of the American West. The experience becomes really overwhelming when worn the appropriate viewers, the Gardaland guests will live an extraordinary and immersive virtual adventure: once crossed the Dreamcatcher, passengers will leave the real world to face the unknown and to be immersed in a parallel reality where they will live, in person, unique and memorable experience adrenaline reaching levels never felt before. The innovative project involves a total investment of 5 million euro for technology development, set design and theming of the attraction. The technical partner chosen by Gardaland is Figment Productions , an international leader in the technology of Virtual Reality and in audiovisual interactive experiences.Figment is a pioneer in the Virtual Reality and has already created some experiences huge success. At the beginning of 2016 he launched - at the Alton Towers theme park in England - the first roller coaster in the world entirely dedicated to Virtual Reality: Galactica. A few months later was inaugurated at Thorpe Park near London, "The Ghost Train of Derren Brown". Rainbow MagicLand 2016 will equip one of its three roller coasters with virtual reality technology ( we reported ).It was now known which roller coaster passengers will be kidnapped in virtual worlds in 2016 and which topic will be used. Already in June "L'Olandese Volante" ("The Flying Dutchman") will be invited to a virtual trip across the world's oceans. The guests of the Mine-Train roller coaster experience an adventure on the high seas, past cannon balls, in the fight of the pirates, thanks to virtual reality glasses. The "film" is adapted to the movements of the real roller coaster ride. 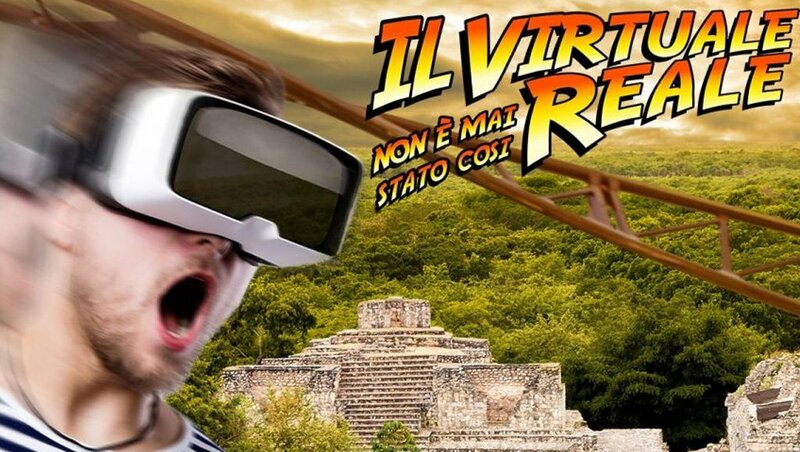 The VR experience on "L'Olandese Volante" is the first virtual reality roller coaster in Italy. Technology is now very popular with leisure parks, as last year the Europa Park was the first leisure park to equip an existing roller coaster. In 2016, many other leisure parks presented VR roller coasters - in Germany, for example, the "Schloss Thurn " adventure park with "Dinolino's VR-Ride" . 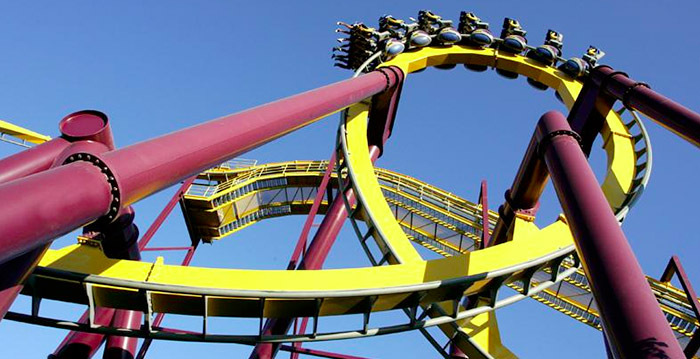 The Six Flags group even announced to equip a total of nine leisure parks in 2016. Visitors to a Spanish amusement park can from next year to experience what it's like to race through Gotham City super hero Batman. 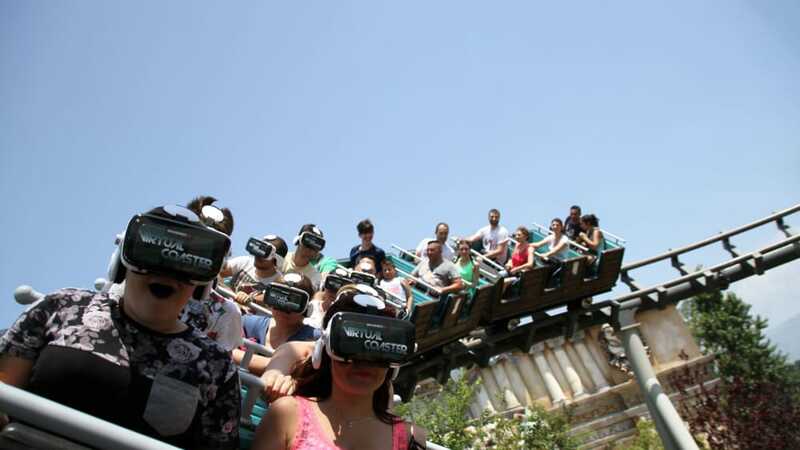 The spectacular roller coaster Batman: La Fuga at Parque Warner Madrid is equipped with virtual reality glasses. Batman: La Fuga is an inverted coaster with passengers hanging under the rails. The 32-meter runway has five inversions. The top speed is 80 kilometers per hour. According to the story behind the attraction is a villain escaped from prison Arkham Asylum. for the addition of virtual reality park works with Samsung. Parque Warner Madrid is owned by the chain Parques Reunidos, just like Bobbejaanland in Belgium. The Flemish theme this year presented the virtual reality rollercoaster Mount Mara , also in cooperation with Samsung. Warner Bros. Movie World has announced a unique and immersive experience for guests with the launch of the Southern Hemisphere’s first Virtual Reality rollercoaster experience opening in September 2016. The Gold Coast theme park’s Arkham Asylum coaster, which was developed in partnership with Warner Bros. Consumer Products on behalf of DC Entertainment, will be launching with Virtual Reality transforming the ride into a 360-degree experience with the technology seamlessly syncing the physical attributions of the popular coaster with the visual to take guests on a multi-dimensional journey while reaching speeds of up to 85km/h and pulling 4.2Gs. Warner Bros. Movie World General Manager, Greg Yong said this is an exciting announcement for the park with the revolutionary technology sure to offer an all new experience for guests. Yong stated “as Warner Bros. Movie World celebrates its 25th anniversary, we are excited to announce we are bringing this innovative technology to one of the most exciting, signature attractions at the park. “With the addition of the Virtual Reality technology to the Arkham Asylum ride, which is inspired by Gotham City’s asylum in the world of DC’s Batman, guests will experience the synchronization of thrilling twists, turns and loops of the coaster with the virtual world of high-definition imagery and visuals created. 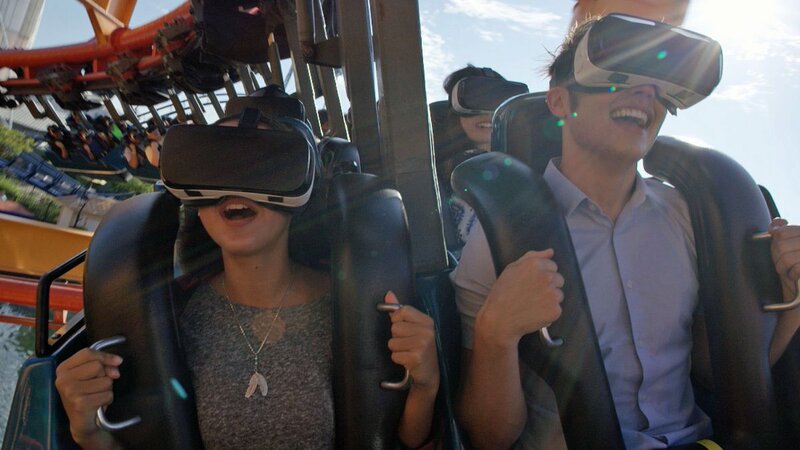 “Guests will wear specialised Virtual Reality headsets as they embark on an epic multi-dimensional journey unlike anything ever experienced at the iconic Warner Bros. Movie World theme park.” The Virtual Reality experience at Movie World will be powered by VR technology and will revolutionise the traditional rollercoaster experience. The Virtual Reality experience will be a pay-for-play experience. peep and ECG like this. A bunch of SF parks are supposed to switch up their VR, be it ride or experience, so there's that to look forward to. Thing is, some of these coasters will actually be improved in terms of their experiences, not operations. can I suggest a we change the title to something like "which coasters are being funked up this year?"? I have a love hate relationship with VR. I can't say that as of yet I've ridden a coaster with VR but i 100% understand why they are so hated. However in my house I own an HTC Vive and my housemate owns an Oculus Rift. Talking for a moment about pure experience point rather than capacity issues. I love my HTC Vive and gaming with it. The novelty games like Space Pirate Simulator, Emily Wants To Play, Keep Talking & Nobody Explodes and Job Simulator are great fun in groups to a level the Wii never reached. (I've had a few CF'ers over who have played some of those) And the more serious games like EVE Valkyrie, Resident Evil 7, Obduction and GTA VR are some of the most immersive gaming experiences I have ever had. The thing is those experiences are run by a top of the range and pretty expensive PC. Especially when talking about the more serious games they need some serious processing power. One issue with VR in coasters is they tend to use things like the Samsung Gear which are mobile phone powered so they just cannot push the number of polygons a gaming PC can. And it will be some time until a coaster based rig can do that amount of processing. secondly and perhaps most importantly what makes VR gaming most amazing is the interaction you have with the virtual world. For example StoneCold could pick up a fire extinguisher in Job Simulator and throw it at his boss just like he has always wanted. VR coasters don't have that level of interactivity and I don't really see how they can. They will forever be just a VR video rather than a VR Experience. In my option where VR will work best in the public domain is in setups like the forthcoming "The Void" which are interactive and built for the VR setup (see video below). Another half and half video of the Void >here< And look up the ghostbusters Void Experience video as well. The problem is how do you integrate that at a theme park because capacity is so low. I am not sure you can. As a small scale laser quest thing it could be amazing but as a big attraction I am not so sure. In conclusion I love VR and it can often be incredible. but I'm not sure it is ready yet for theme parks in its current setup. I've said on this forum for a good year or two that The Void is just HOW you do VR. It's incredible. They actually have produced several attractions so far that have gone under the radar and to be honest, if a park paid them to whack one in, I know I'd be absolutely over the moon with it! As Lofty says, I can see the "VOID" type experience working really well. It's basically like laser-quest v2.0, and would be a really cool use of the technology. It would let you experience the same VR world with your friends, something which is currently very difficult to do, and give a lot more flexibility to VR (different settings, different game mechanics, etc). I can really see that becoming popular both in parks and outside. I'd love to give it a go. The problem with VR is that it's just being used really poorly in parks at the moment. As you rightly say, VR gaming is really quite impressive and has so much going for it, but fundamentally, the point of VR is escapism. It's really just an enhancement to screen technology, and is designed to let you immerse yourself in an 'interesting' environment. I think the argument, which I support, is that when you're at a theme park you're ALREADY IN AN INTERESTING ENVIRONMENT. What's the point in putting on a headset and not actually experiencing any of it? Might as well just stay at home. This issue is even more pronounced with VR on 'proper' roller coasters (like Superman). Isn't the point of that ride that it's big and high and fast and impressive and a unique experience? Why would you think it's necessary to take all of that away from the rider? I find it a really strange move by the parks - surely they know this? That doesn't even touch on the issues with operations, which mean it should be ruled out by any self-respecting park who cares about giving guests a good day. ^, ^^ & ^^^ Isn't the new upcharge VR attraction for Knott's Berry Farm going to be a "VOID" type experience? ^I believe so, and it's exactly what I'm like to see more of. Will be really interesting to see how Knotts do with that type of attraction. Lots of potential, and will (hopefully) start the trend of VR being removed from coasters and installed on this kind of attraction. Well, a new VR attraction has been announced for Six Flags Over Georgia. "Drop of Doom" will be taking over Acrophobia March 11th for a limited time. It appears to be spider themed with the video having lots of large spiders featured and a few crawling on riders. Well, I've always understood the potential for VR on a coaster. It could be a very interesting way to do a realistic simulator. I have nothing against that really. However, on a drop tower, I feel it makes no sense. The fear from a drop tower is the height!! I feel you can't see the height then half of the thrill is lost. I just don't see how VR could even work on this ride. It just goes up and then down. Anyway, rant over. Maybe not all bad news. See 08:00.
davidm and ECG like this. Wow! Not only is VR being removed from Superman, it's not being put on any other attractions. Way to go Six Flags New England! Of course putting VR on your most popular coaster was a bone head move to begin with, but hopefully it won't take long for other parks to follow suite. witchfinder and Temleh like this. So Six Flags over Georgia announved yesterday that Acrophobia will be recieving the VR experience permanently. Its VR Experience will be themed to Spiders, which sounds cool, but the video they posted on their Facebook page said something about being "100 stories"...so will this be a multiple drop experience instead of the regular Up > Tilt > Drop? I think it's rather that they will use the VR to make it seem like the tower is a lot taller than it really is. After all, your body is able to experience a "lift" and "drop" sensation, but without the eyes to guide, it can't tell how far you're being lifted or dropped. With an appropriately-crafted movie to deceive your eyes, the ride might be able to convince you that you're being lifted 300 metres into the air instead of, say, 60. For me, the only time to use VR on a drop tower is for a tiny drop - not one that's actually substantial where the point of the height is for visual experience. The removal of VR from Superman is excellent news, shouldn't have been done in the first place but at least they've realised it doesn't work on the top attractions. Here's hoping other parks look at the failure and bear it in mind when thinking of adding more VR. If Kraken also fails, then we might be able to knock it on the head altogether. 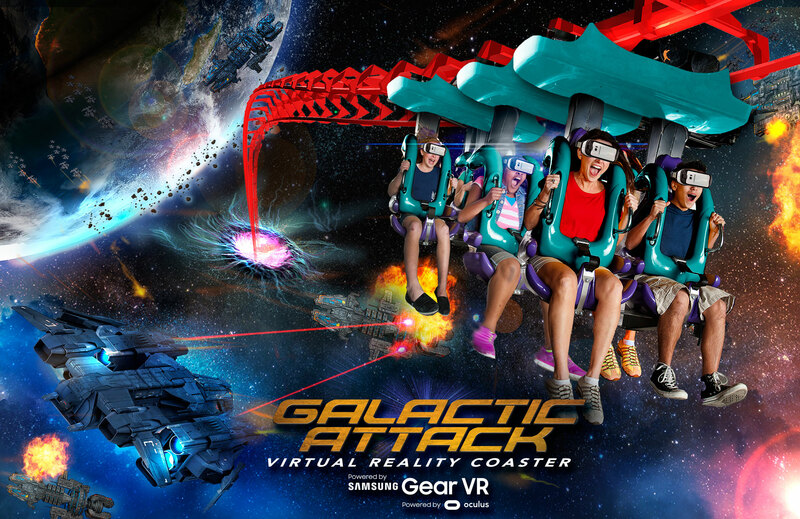 Mind Eraser, the park's SLC, is becoming Galactic Attack Virtual Reality Coaster. It will be a combination of AR and VR, with riders "being introduced to the Samsung Gear VR’s passthrough camera functionality, instantly making them aware of their surroundings, by allowing the riders to see the “real world,” including the person seated next to them— along with virtual content. As they get settled into the ride, a heads up display overlay on the passthrough camera view will show data like current status of weaponry, time codes, fuel cells, and a countdown clock. Cresting the lift hill, a massive, swirling wormhole comes into view. As riders drop at high speeds, the mixed reality view changes to a completely immersive, virtual reality environment and a fighter spaceship cockpit materializes and envelops the riders into a tunnel of light. At the bottom of the first hill, riders are launched into the middle of a space battle, coming under attack from flying drones firing lasers and missiles. After swinging through tight channels, narrowly dodging drones and artillery fire, riders are brought into one of three drone bays, each of which offer a completely different gaming experience and three different endings." At least the trains are being outfitted with new restraints to make "a more comfortable, smoother and exhilarating ride experience than ever before". I'm sure this will be horrible in terms of operations but to be fair, the graphics look pretty decent and I do like the idea of an augmented reality experience. Also with it being on a crappy clone it's one of those things you can skip if you don't fancy it, without missing out on a decent ride. I'm heading to SFNE for the first time this year and I'm more excited about that ride now than I was when it was just a standard SLC. Video of the Gardaland one, named Shaman.